Purity: Greater than 90.0% as determined by:(a) Analysis by RP-HPLC. (b) Analysis by SDS-PAGE. 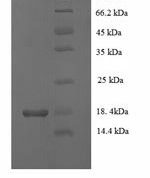 VEGF-C152, Vascular endothelial growth factor C 152, VRP, Flt4 ligand, Flt4-L.
General Description of Recombinant Rat VEGF C.
Rat Vascular Endothelial Growth Factor -C 152 contains 152 amino acids residues and was fused to a His-tag (6x His) at the C-terminal end. As a result of glycosylation VEGF-C migrates as an 18-24 kDa protein in SDS-PAGE under reducing conditions. Host: QP10911 protein expressed in Insect. Protein Construction: A cDNA sequence encoding the sequence of VEGF C was constructred and used to recombinantly synthesize the protein. Recommended Reconstitution Instructions: It is recommended to reconstitute the lyophilized Vascular Endothelial Growth Factor C 152 in sterile 18MΩ.cm H2O not less than 100µg/ml, which can then be further diluted to other aqueous solutions. Bioactivity Data: Measured by its ability to stimulate phosphorylation of the VEGFR-3/FLT-4 receptor in porcine aortic endothelial cells (PAE/FLT -4 cells). 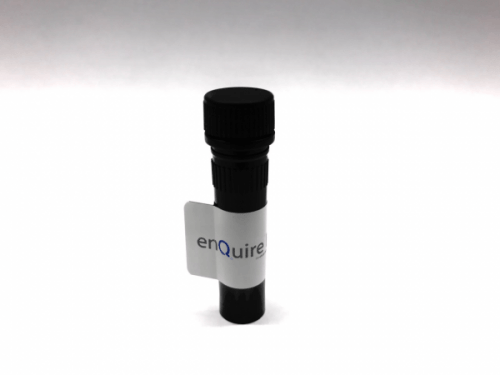 The ED50 for this effect is typically 150-300 ng/ml, corresponding to a specific activity of 3.3-6.6KUnits/mg. 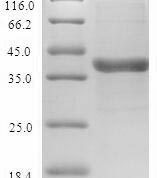 Buffer: The protein was lyophilized from a concentrated (1 mg/ml) solution with BSA. Storage Conditions: Lyophilized Vascular Endothelial Growth Factor-C152 although stable at room temperature for 3 weeks, should be stored desiccated below -18°C. Upon reconstitution VEGF-C 152 should be stored at 4°C between 2-7 days and for future use below -18°C. Please prevent freeze-thaw cycles.